The crash involved at least two vehicles and left one person dead. LAKE ST LOUIS, Mo. — Interstate 70 has reopened after a deadly crash in the eastbound lanes during the morning rush Monday. The crash involved at least two vehicles and left one person dead. It happened shortly before 7 a.m. just east of the Lake St. Louis Boulevard exit. The man killed has been identified as 44-year-old Gary Barton. I-70 didn't fully reopen until about four hours later. 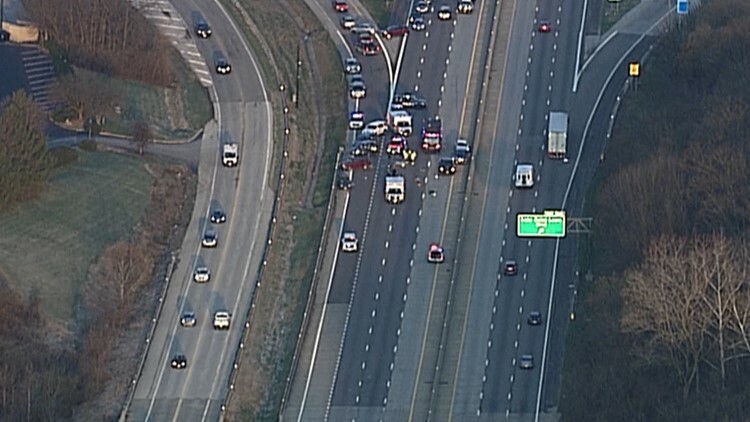 Shortly after the crash, the view from Sky5 showed debris across all lanes of I-70 and several vehicles stopped on the road. Barton was traveling on I-70 and attempted to slow down for traffic and began skidding, according to the crash report. He went off the side of the road and then drove back onto the interstate and crossed into the third lane, hitting another car. Barton's car overturned, and he was ejected.